As I was trying to decide what I was going to write about this week, I decided to revisit the very first recipe I shared three years ago, my Spring Matzo Ball Soup, which I actually made for lunches this week. 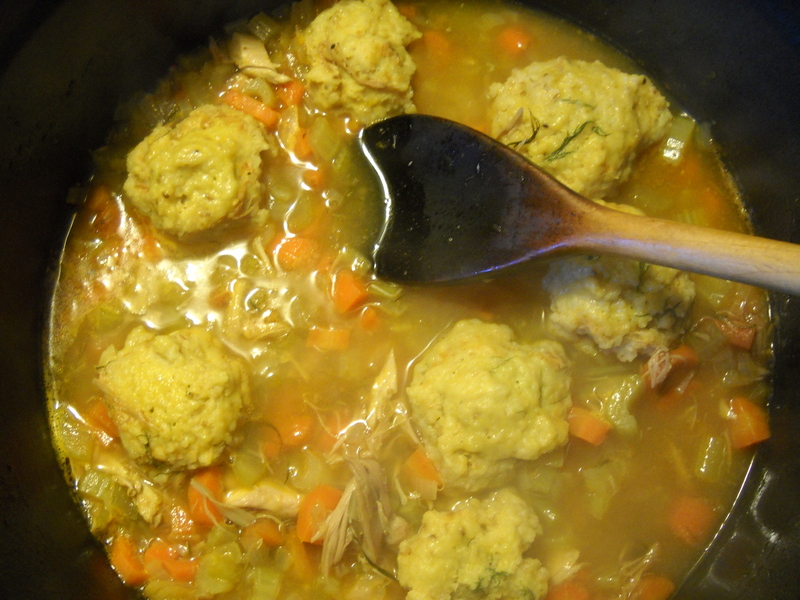 Chicken soup of any sort is comfort in a bowl for me, and adding dumplings, noodles, or in this case, matzo balls, makes it all the more comforting. I took my original recipe and added and subtracted a few ingredients based on what I had on hand. I usually have some homemade chicken broth in the freezer, but you can certainly make this with boxed broth. I love the flavor of the added fresh dill, it tastes like summer to me, but of course, it’s optional, or you can use another herb. Carrots, celery, and onion are a classic soup combination, but I’ve also added turnip and parsnip if I have it on hand. And if you have some leftover chicken in the fridge, by all means throw it in! Our early spring, along with our winter, has been terribly chilly, so a big bowl of this for lunch is what Mother Nature ordered! Since the matzo mixture needs to rest for at least 20 minutes, make that first before you start working on the soup. I like my soups less brothy, so you may want to use more. 1. In a large Dutch oven, warm the olive oil, and add the vegetables. Saute until soft. 2. Add in the broth, wine (if using), and tomato paste. Bring it to a boil. 3. When the matzo is ready, wet your hands and form matzo into round, one inch balls (about 7-8) and place on top of the soup. Cover and cook for about 20 minutes. Add the dill weed, if using, at the last minute. I can’t take credit it for this, my good friends at Manischewitz can, as it is what I follow when I make matzo balls. They are the best! Beat the eggs, blend the eggs with the oil, matzo meal, salt, and dill weed. Add broth or water, mix until uniform. Refrigerate for at least 20 minutes.